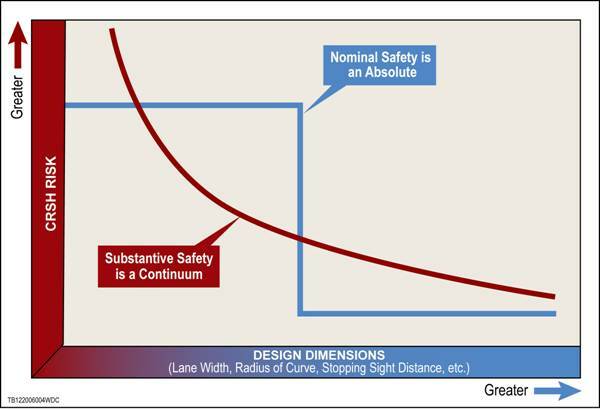 What is important to understand is that the substantive or long term safety performance of a roadway does not always directly correspond to its level of nominal safety. It is not uncommon for a roadway to be nominally safe (i.e., all design elements meet design criteria) but at the same time substantively unsafe (i.e., it demonstrates or reflects a high crash problem relative to expectations). Similarly, some roadways that are nominally unsafe (one or more design elements do not meet design criteria) can and do function at a high level of substantive safety. There are many reasons for this—primary among them is the fact that the criteria are based on many factors (safety being just one) and are derived from simplifying models and assumptions that are broadly applied. In the context of design exceptions and design decision making, the concept of understanding both nominal and substantive safety is critical. When applying design standards and criteria to their full extent, the presumption by the designer is that the resulting highway will perform in a safe (acceptable) manner. In other words, by meeting criteria the road is nominally safe, and as such the designer expects it to be substantively safe in the long term. In actual experience, the level of performance will vary based on the context and type of highway as described above. When faced with decisions to incorporate one or more design exceptions, the designer should reflect on whether the design exception will influence substantive safety, and if so to what extent. In other words, if a design exception is to be used, the designer should seek the best information available that characterizes the long term substantive safety risk of that exception (frequency, type, and severity of crashes). If this is an existing location and a design exception is being studied, how good (or poor) is the existing substantive safety performance? If this is new construction or reconstruction and a design exception is being studied, what should the long term safety performance of the roadway be? Given the specifics of the design exception (geometric element, degree/magnitude of the variance, length of highway over which it is applied, traffic volume, etc.) what is the difference in expected substantive safety if the exception is implemented? By definition, locations with design exceptions are nominally unsafe, in that one or more design elements do not meet minimum criteria. That does not mean, however, that the highway cannot function at an acceptable level of substantive safety. The objective should be to understand the quantifiable (substantive) safety effects expected with a nominally unsafe design decision. Figure 1 is an illustrative comparison of the concepts of nominal and substantive safety with respect to their crash risk models. Current understanding of the relationships among roadway elements, traffic, drivers, and other factors suggests that the true safety risk is better represented by the red line (substantive safety). That is, incremental changes in design dimensions (typical of design exception decisions) may result in incremental (not order of magnitude) changes in substantive safety. What designers should seek is knowledge and data that enable them to establish the substantive safety of a contemplated design decision. This will allow for good judgments about what is acceptable and what is not and also will lead to investigation of mitigation measures to address the potential adverse safety impacts of a design exception. The preceding discussion is not meant to imply that meeting design criteria is unimportant. Safety or traffic operational problems are less likely to develop if design criteria are met. Throughout the design process, designers should strive to meet criteria and look first at using the flexibility inherent in the adopted criteria to achieve a balanced, safe, and context-sensitive design. In some situations, design exceptions will be necessary and the goal is to achieve a high level of substantive safety and efficient traffic operations. At all times the designer should retain the basic understanding that their goal in design is to assemble the geometric elements and implement measures that will deliver as high a level of long term substantive safety as practical. Figure 1 shows a chart with an x-y axis. The y axis represents crash risk, with a vertical arrow labeled "Greater" pointing to the upper left corner. The x axis represents design dimensions (lane width, radius of curve, stopping sight distance, etc. ), with a horizontal arrow labeled "Greater" pointing to the lower right corner. Within the body of the chart, a red line is shown curving from the upper left to the lower right to represent substantive safety, and is labeled "Substantive Safety is a Continuum." Behind the substantive safety curved line, a blue line is shown that begins as a horizontal line (low on the x-axis, high on the y-axis), changes to a vertical line, then back to a horizontal line (high on the x-axis, low on the y-axis), and is labeled "Nominal Safety is an Absolute."